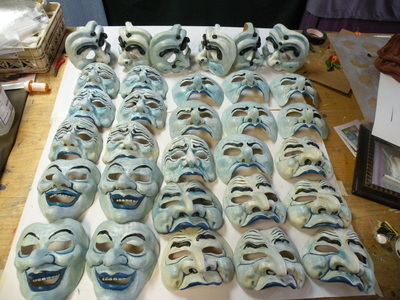 Currently ~ 12 MASKS ON BROADWAY! 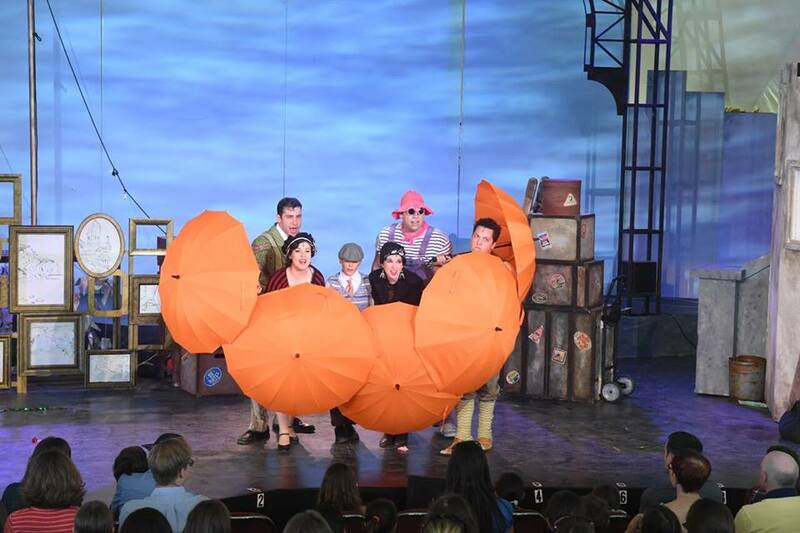 James and the Giant Peach Summer Theatre of New Canaan, Connecticut. 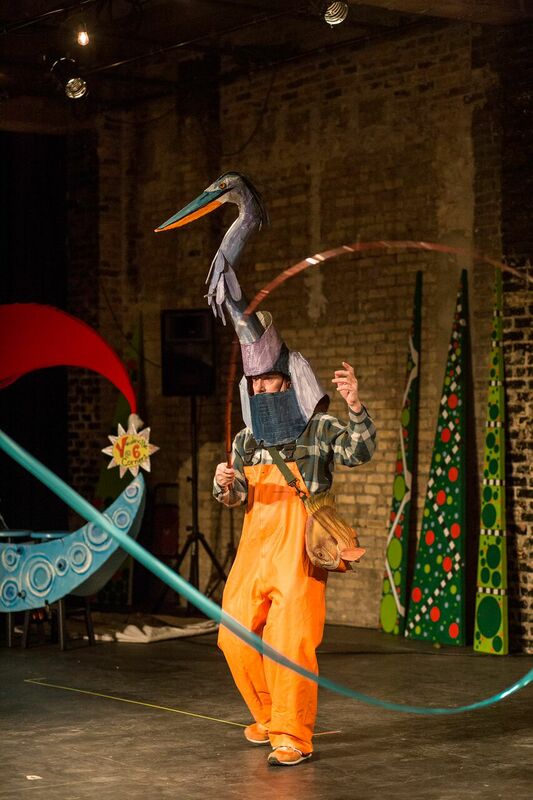 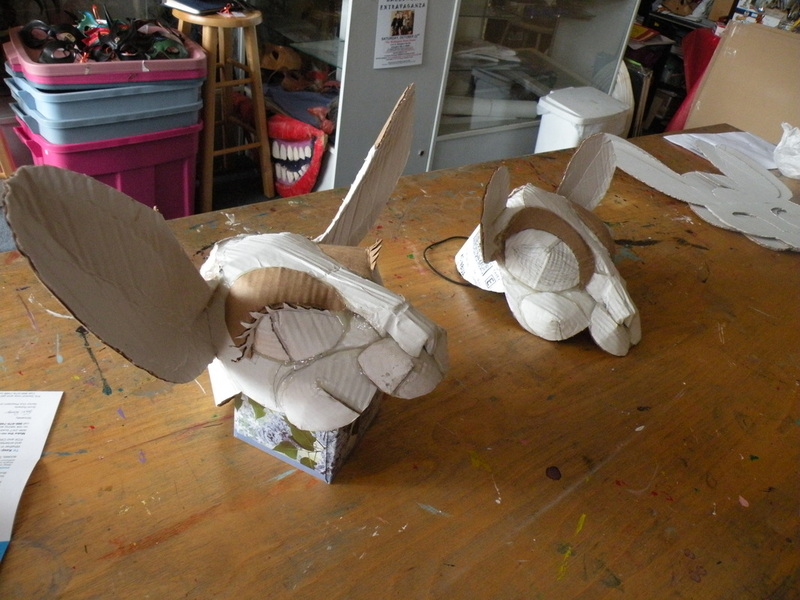 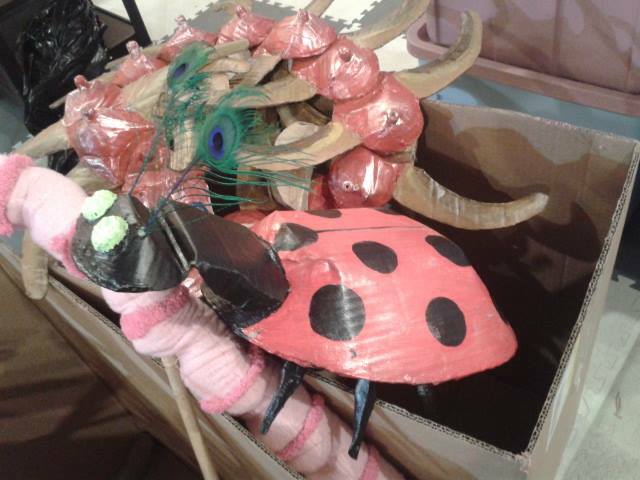 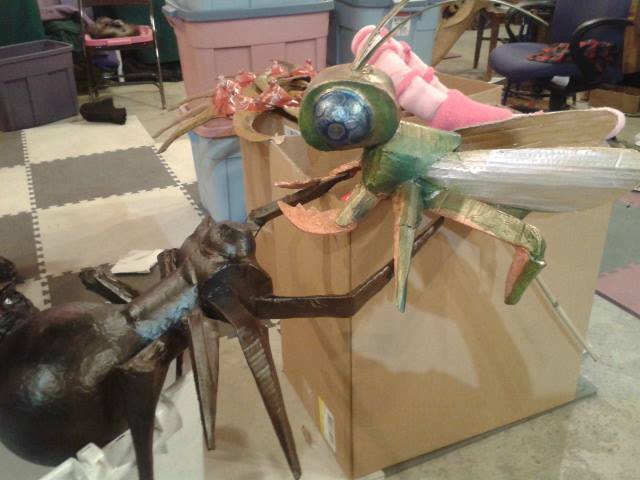 We made insect puppets and two humanetta Aunts for this fabulous traveling production. 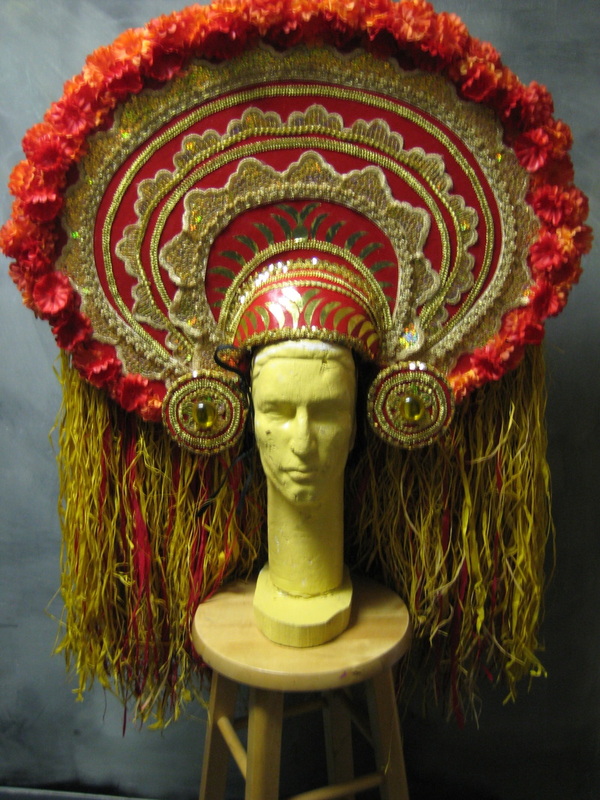 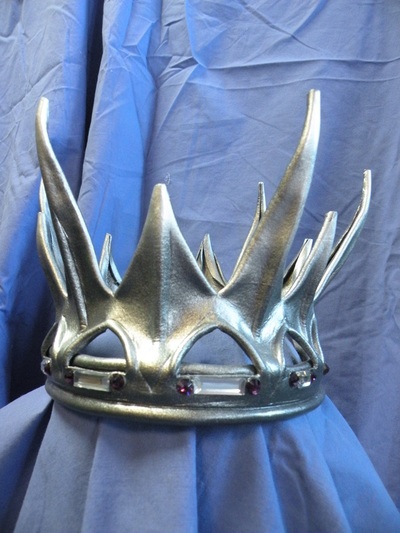 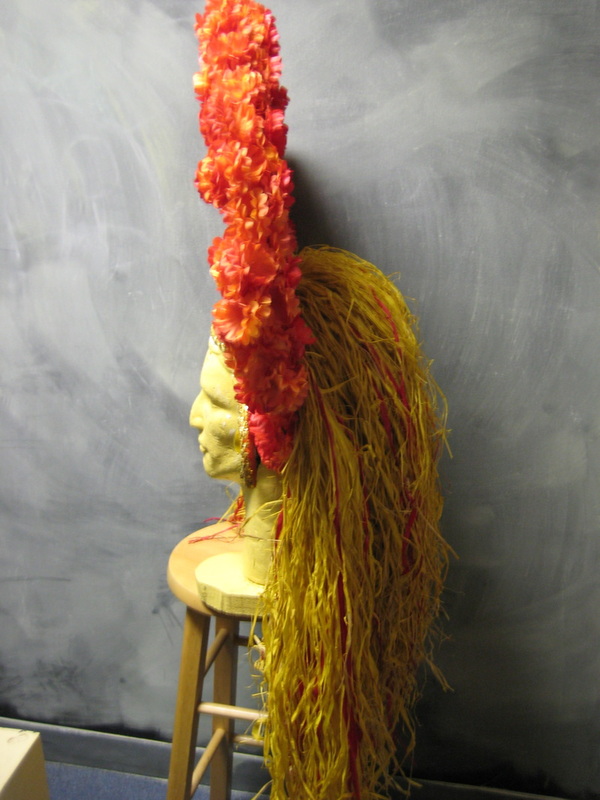 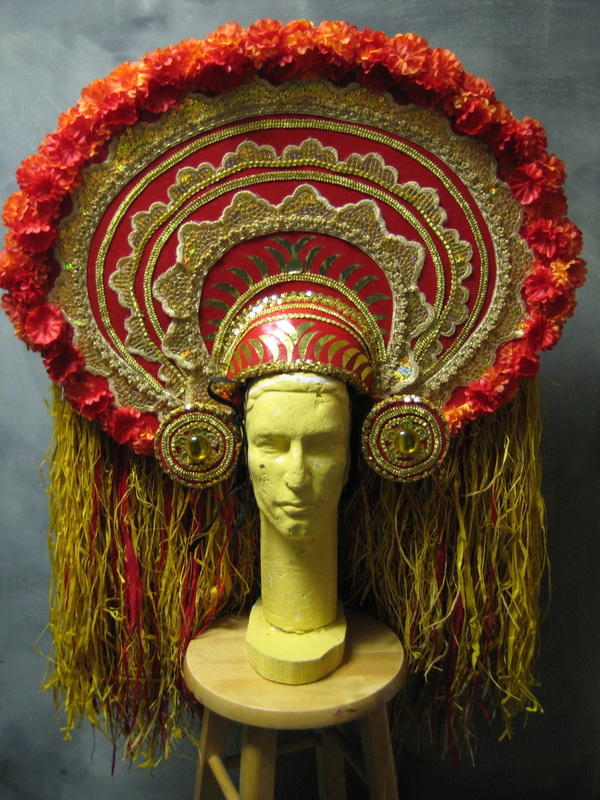 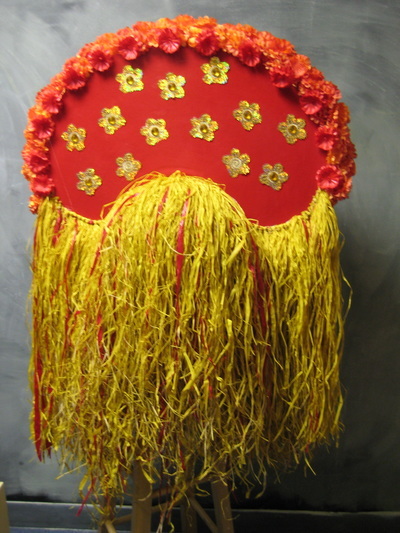 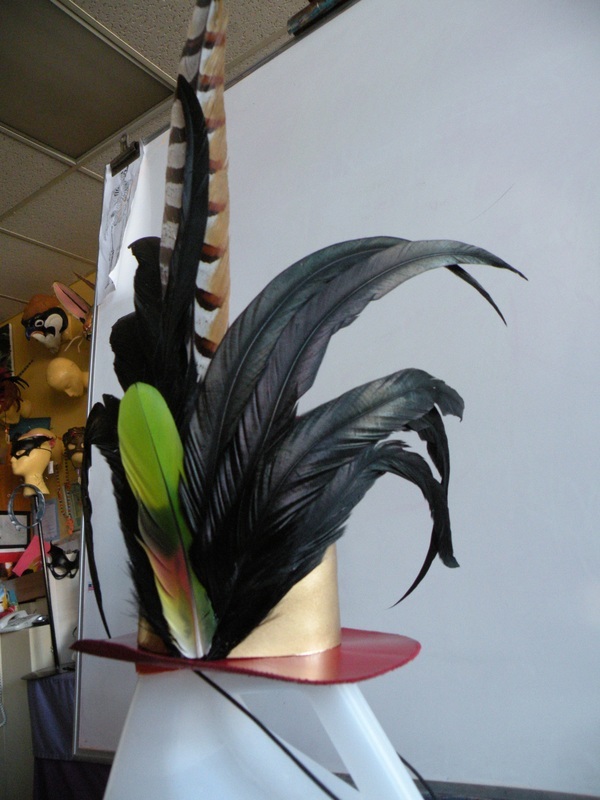 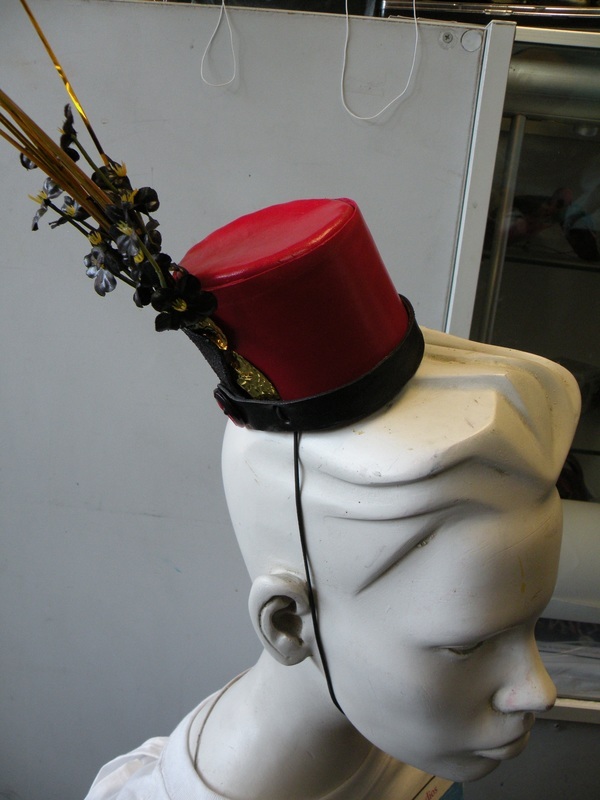 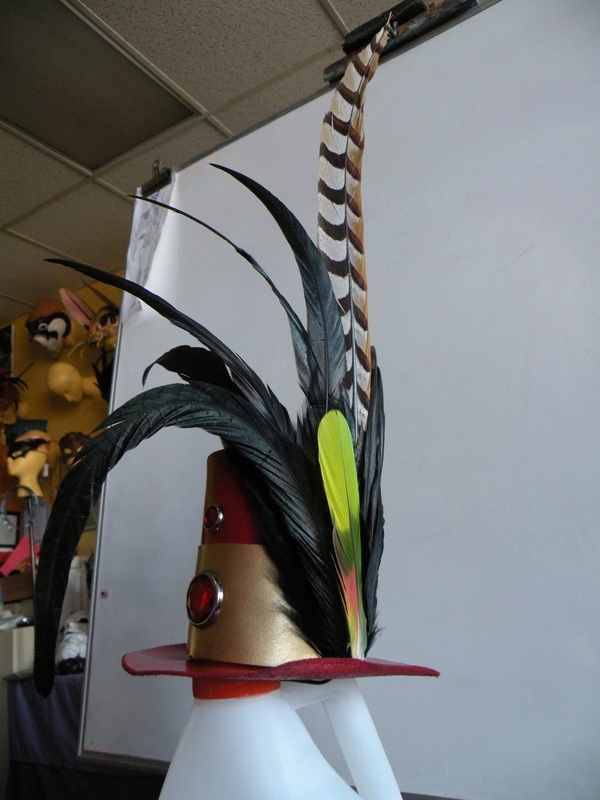 We made this fabulous headdress for the production Worn by the KING. 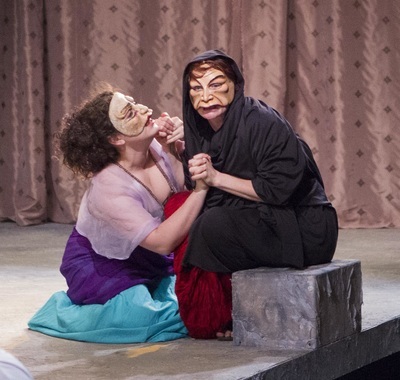 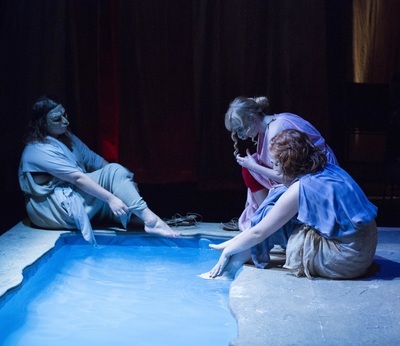 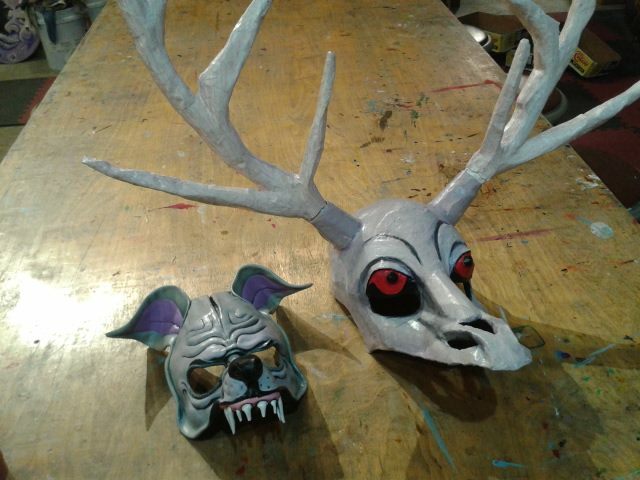 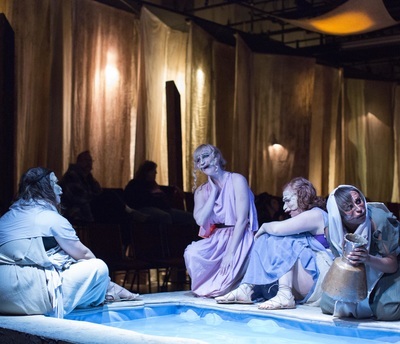 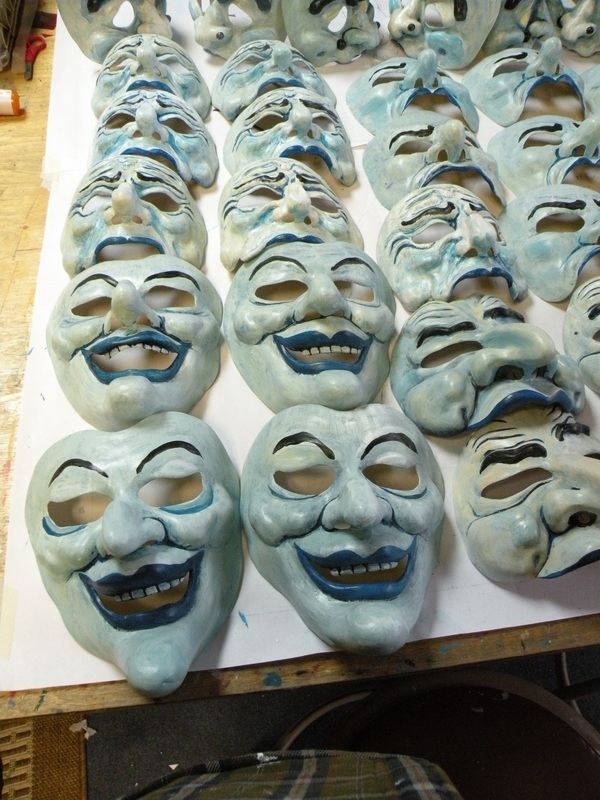 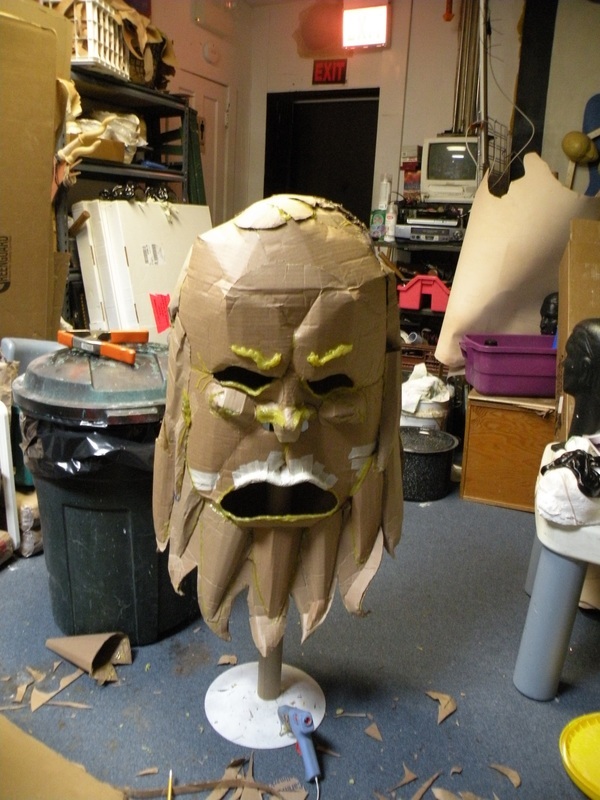 HECUBA Columbia College, Chicago 2013 We made 35 masks for this ambitious Greek Tragedy. Many masks students helped prepare. 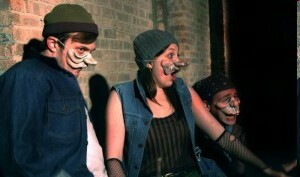 Directed bu Andrea Diamond. 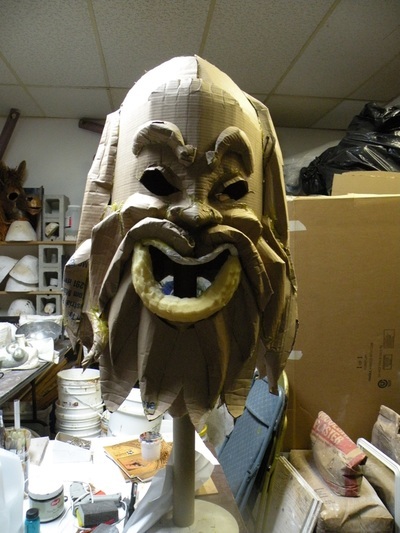 From your renderings or as your mask designer and maker ~ your actors will not believe how easy it is to work in a Semmerling mask. 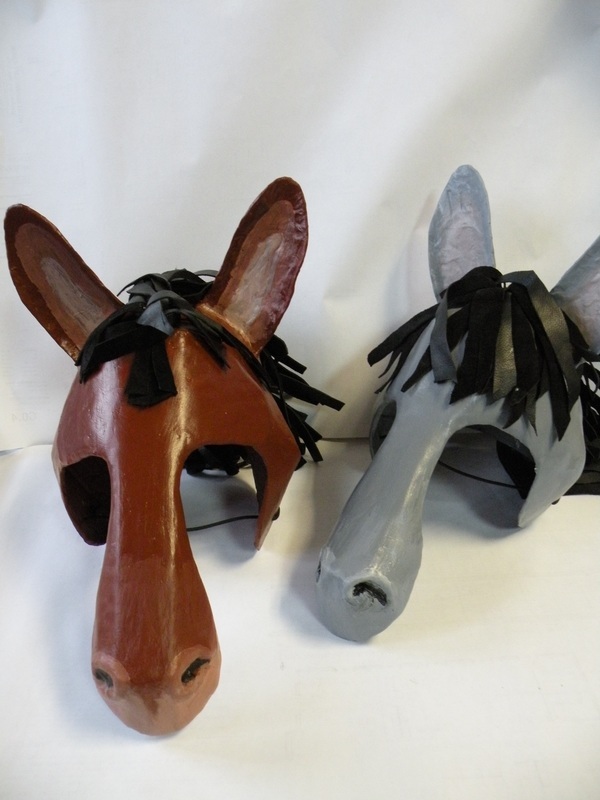 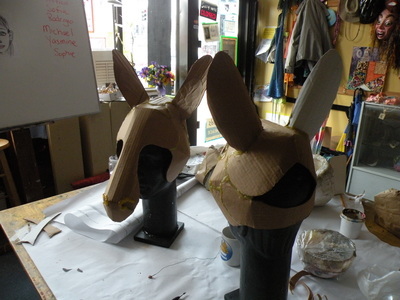 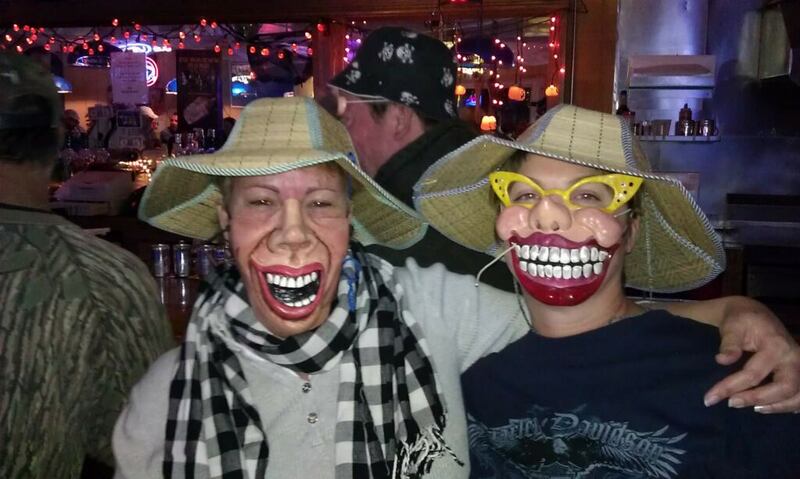 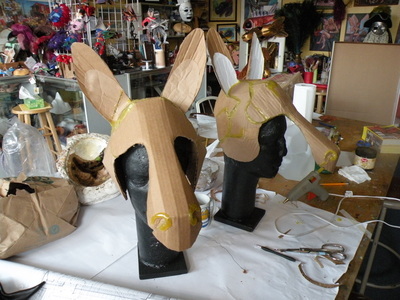 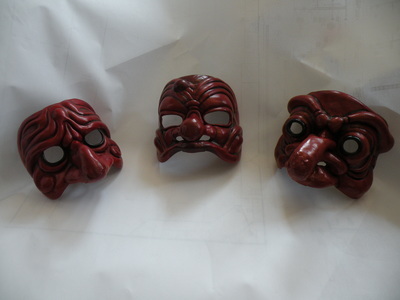 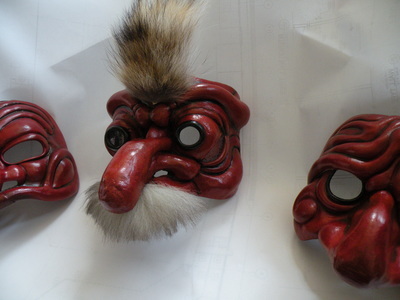 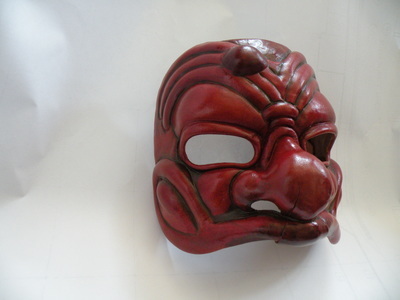 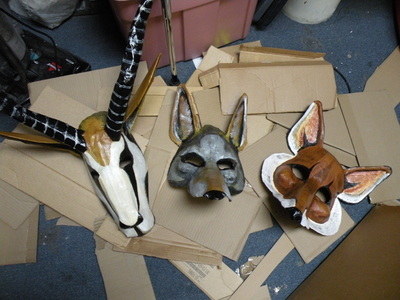 Big masks, yet easy to wear. 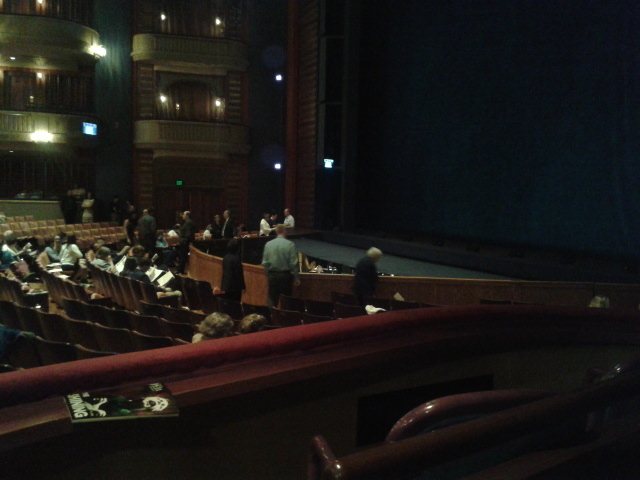 Romeo I believe. 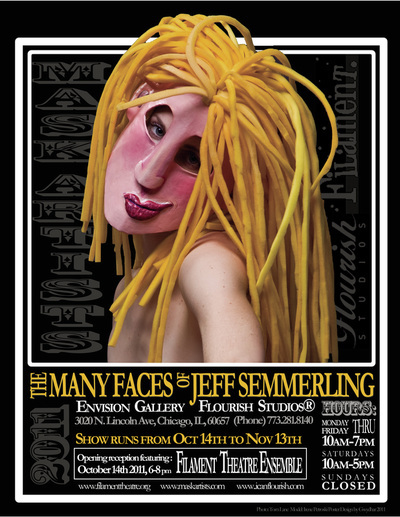 This was the first show I did for the great designer Jennifer Caprio. I've done many since. 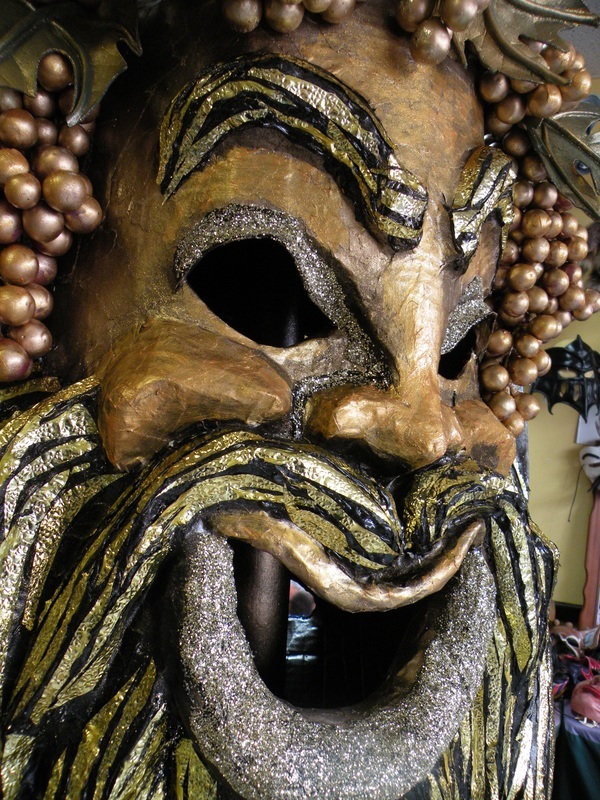 Click on this one and see the whole magnificent mask! 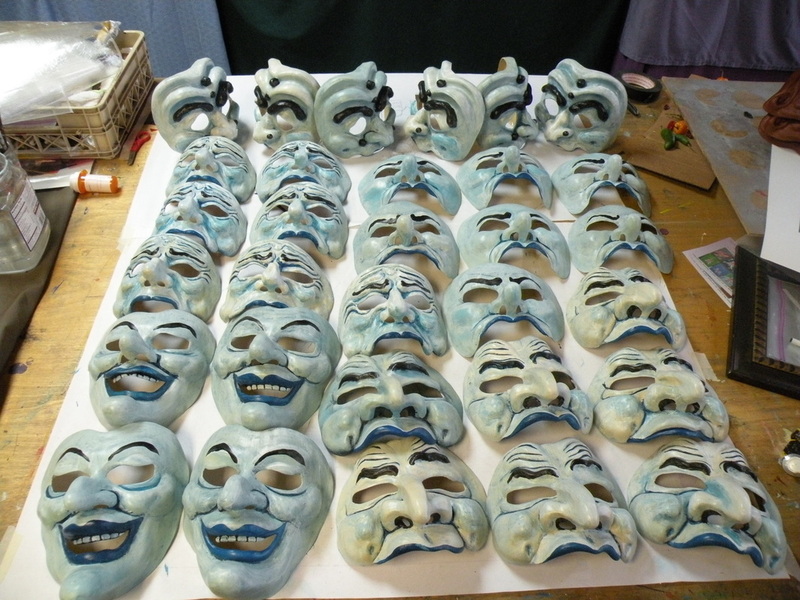 In 2017 Jennifer Caprio got 12 of my masks for Lincoln Center Theatre's "Falsettos," ON BROADWAY! These were my designs for the Four Horsemen of the Apocalypse. The White Knight, some feel would be the Second Coming of Christ, he wears a Splendid Crown. 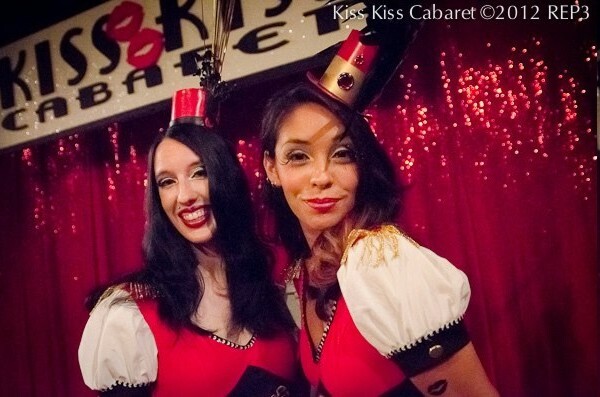 I'm sure they can be seen still in the Kiss Kiss Cabaret, Up Town Underground! 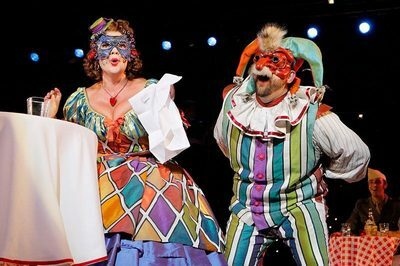 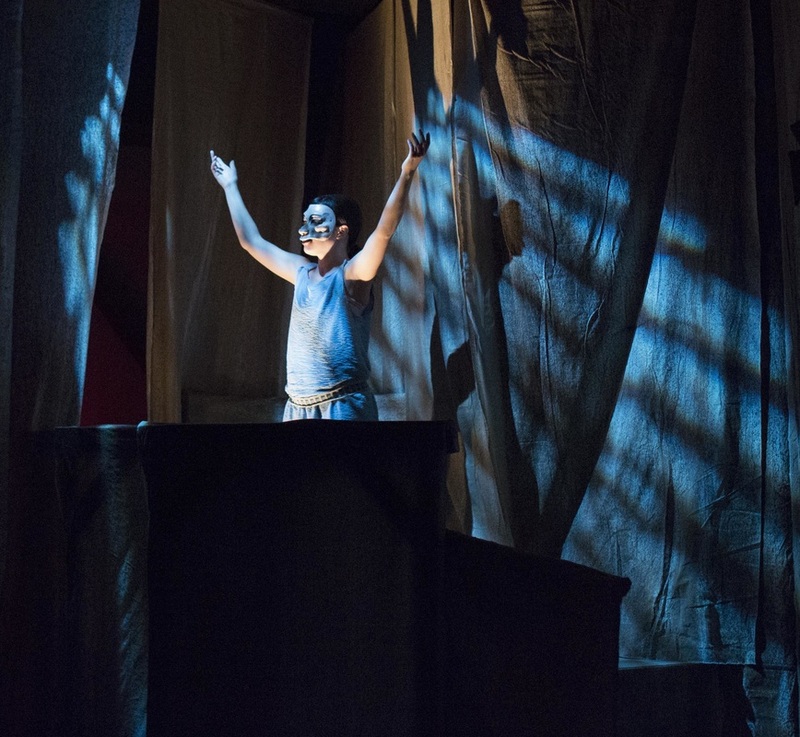 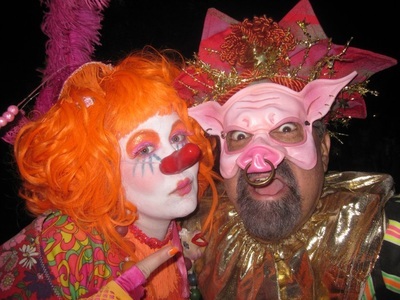 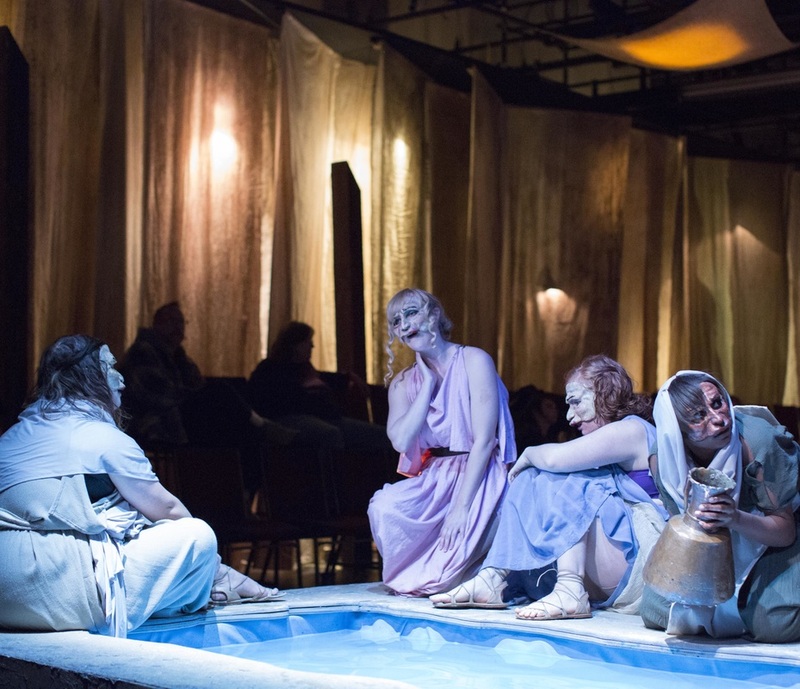 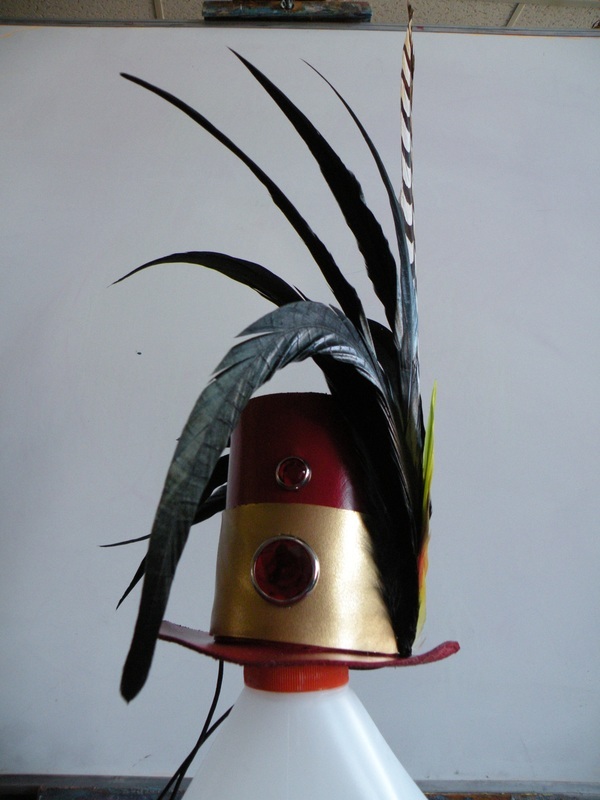 June 2012 my second job for the prolific Jen Caprio was a "Pagliacci" she designed for the "Mill City Opera." 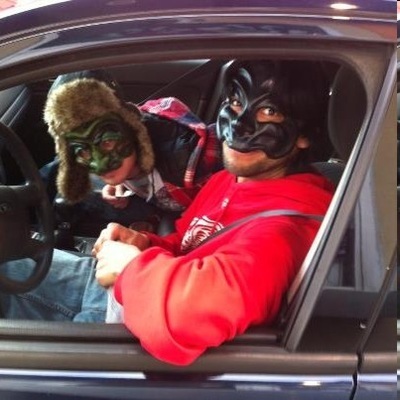 The masks worked out very well. The actor all became fans of my work. Now in New Orleans I have some FANS!!!! 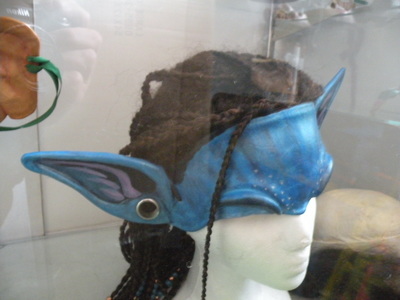 A Navi Mask made for a very important client's Halloween costume. 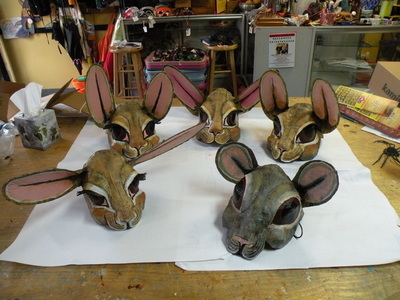 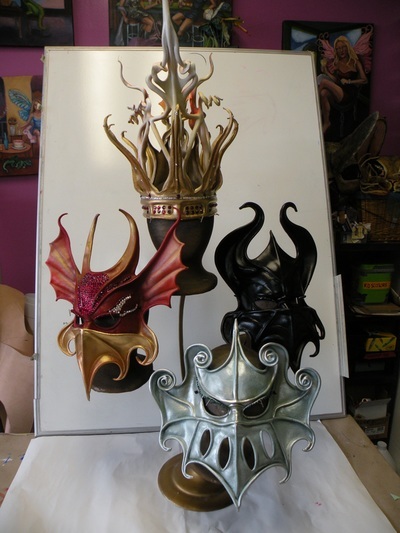 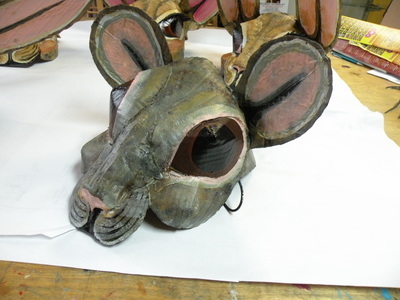 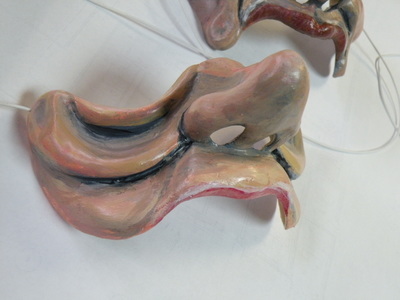 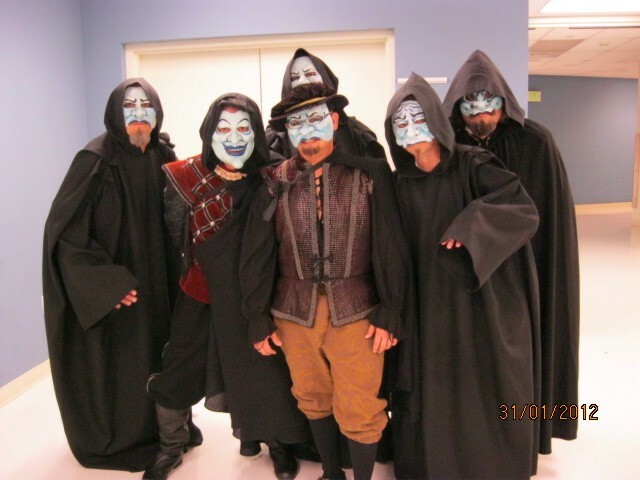 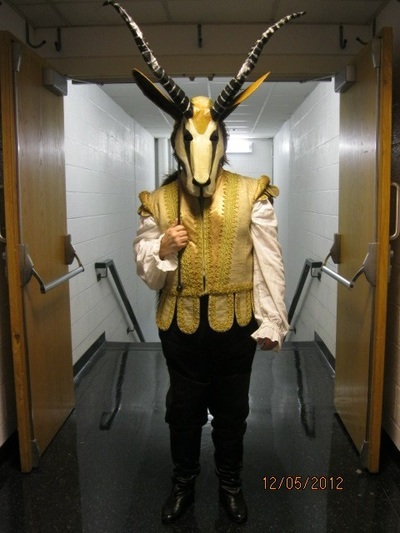 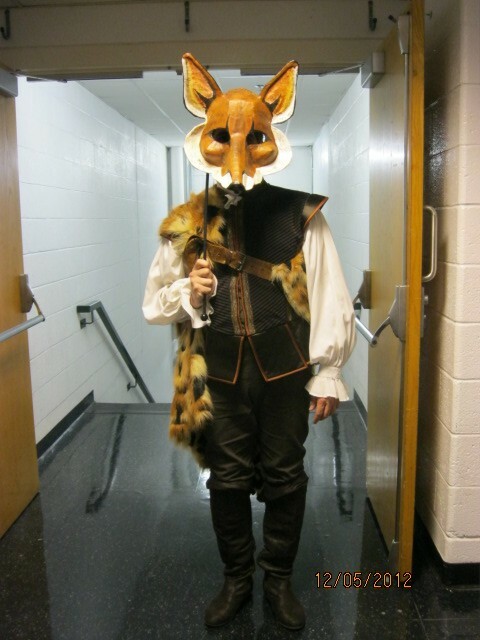 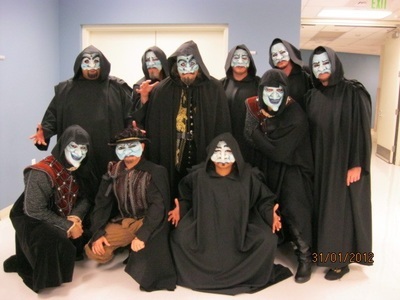 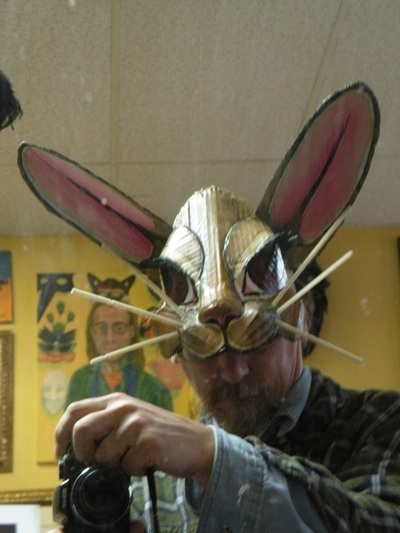 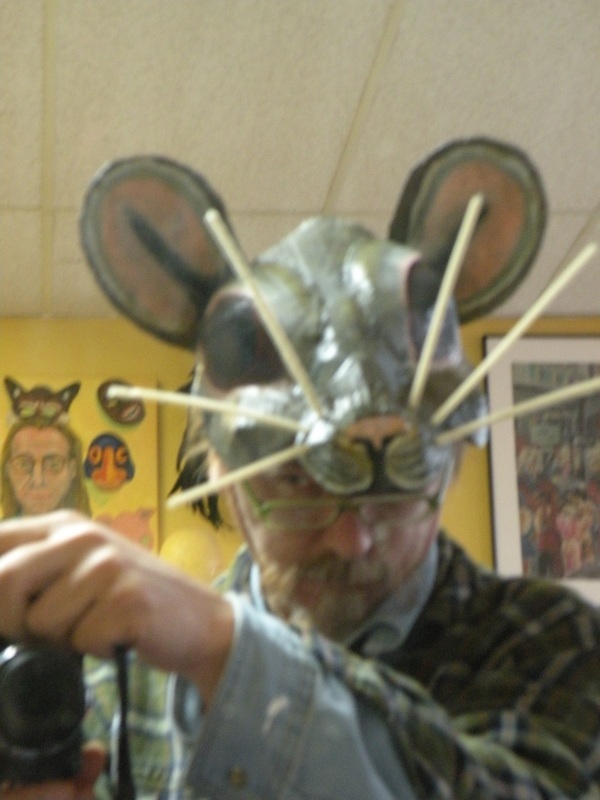 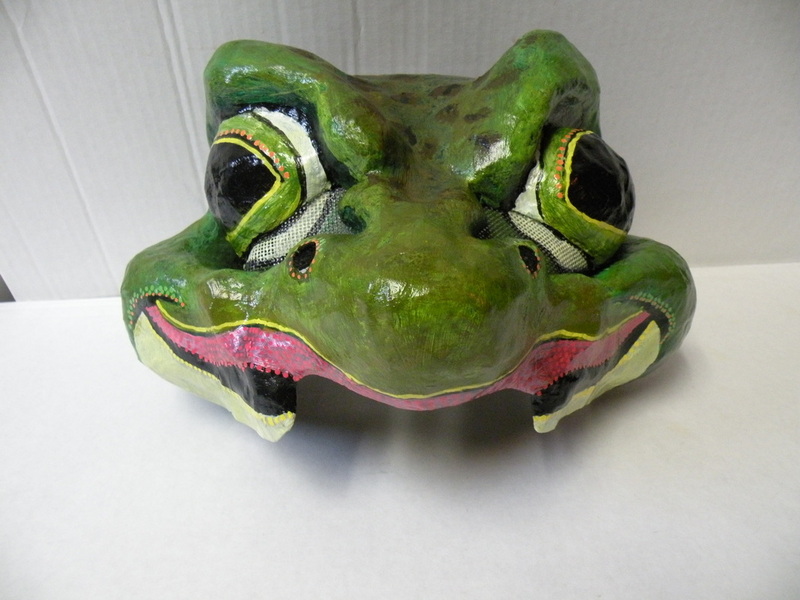 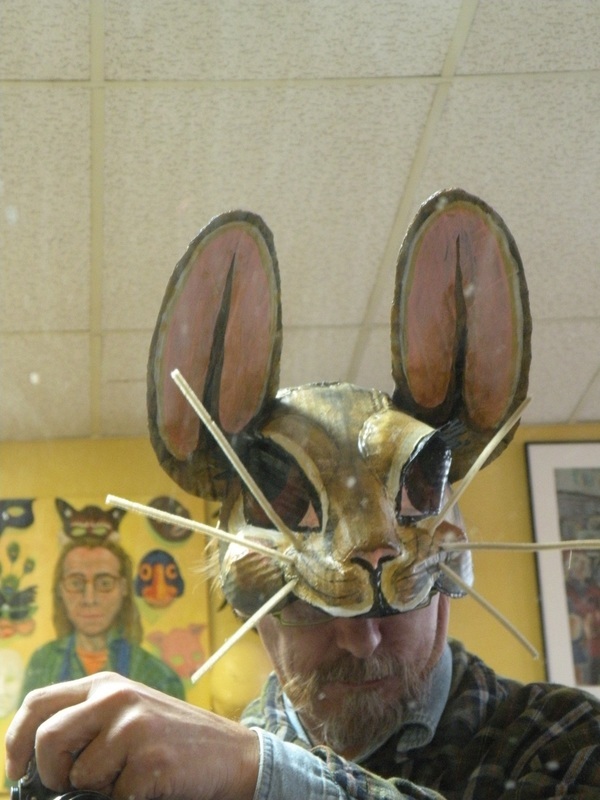 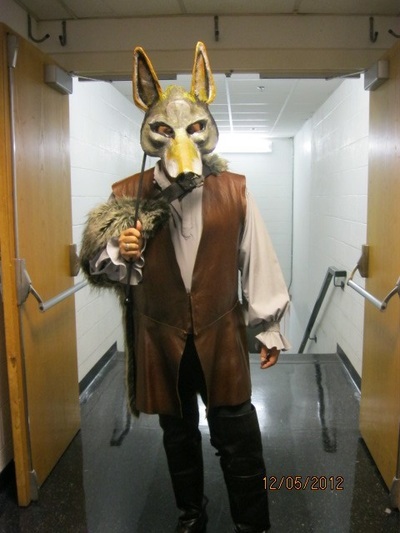 T. J. Corbett has a Commedia Dell'Arte Company in Michigan that uses some mighty fine masks. ....and not just for this production. 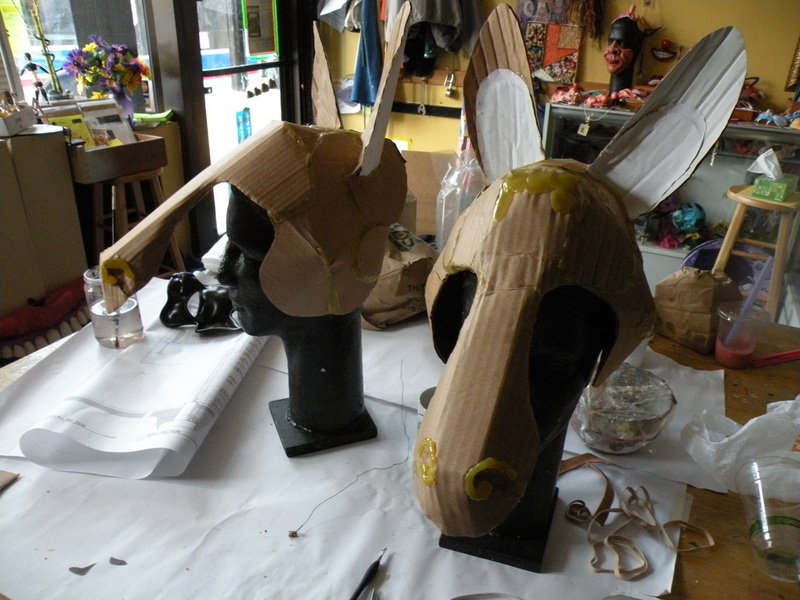 These horses were made for a production of "Gulliver's Travels." The Horse People. 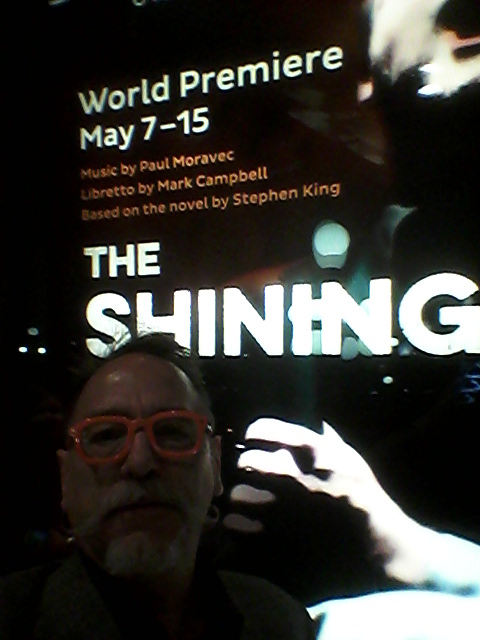 By Chicago's "Little Buds Theatre" I believe. 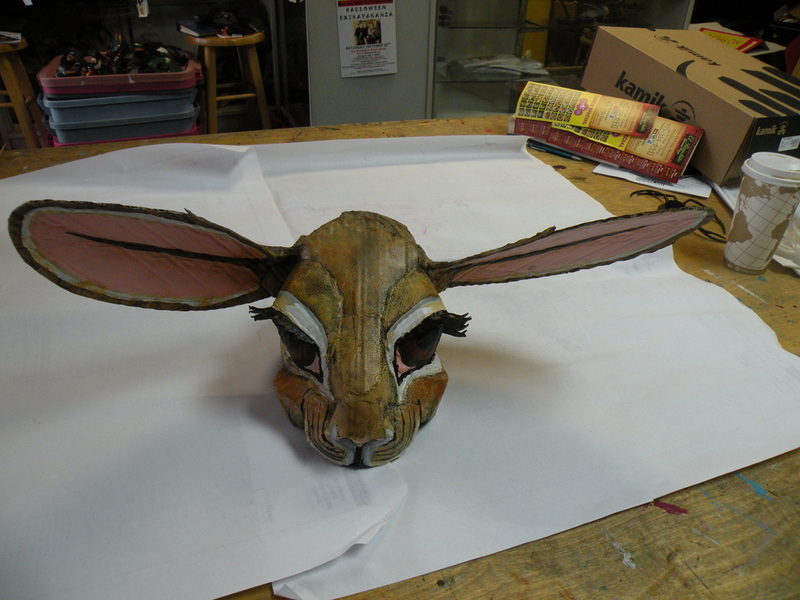 Every once in a while I jump at a chance to work for Omen Sade. 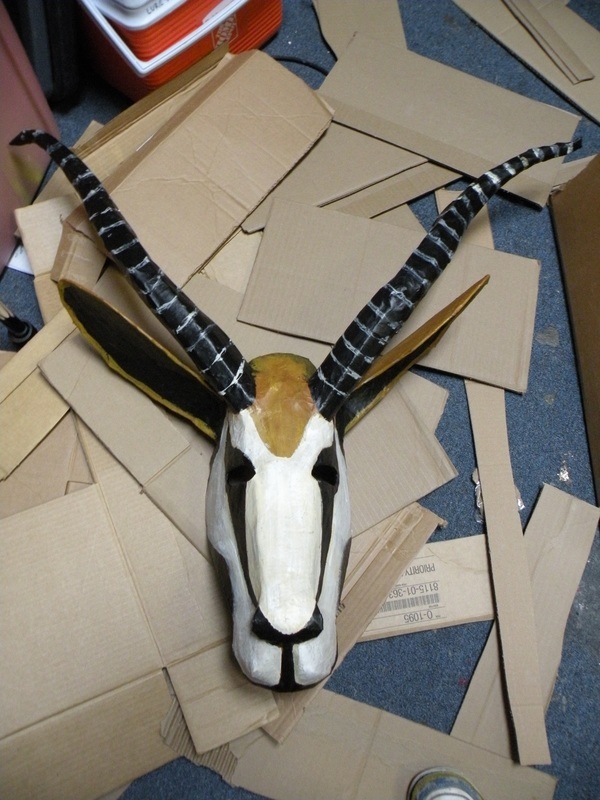 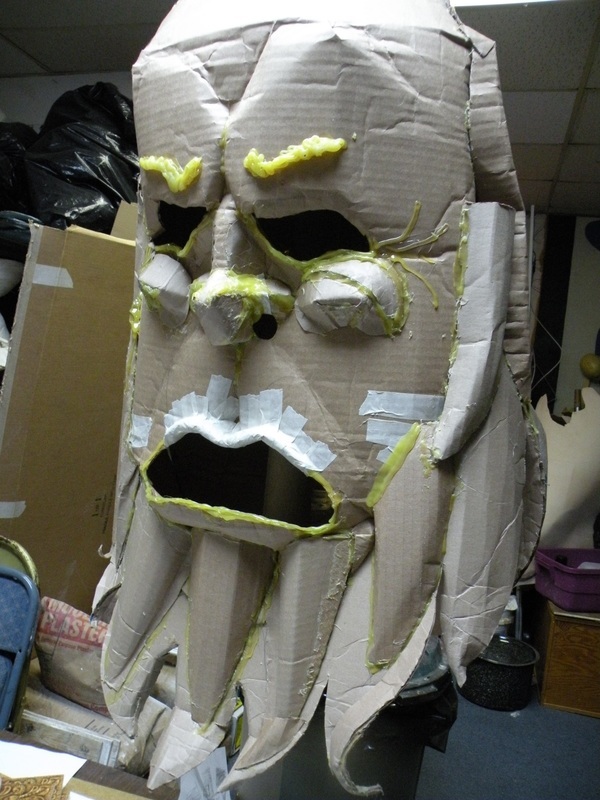 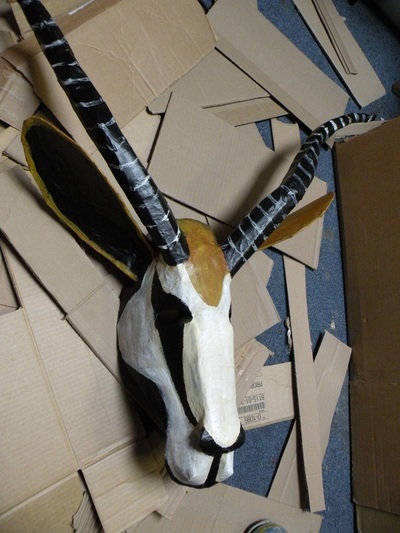 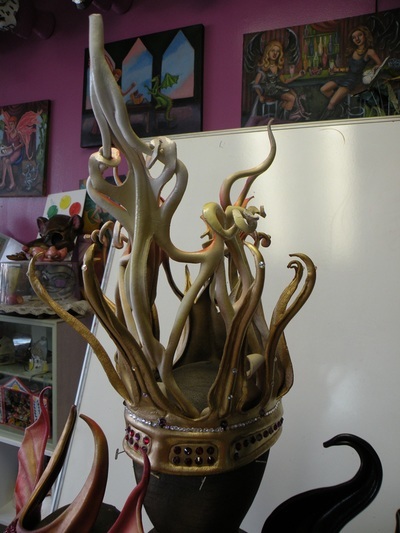 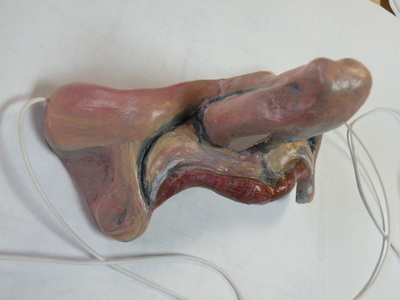 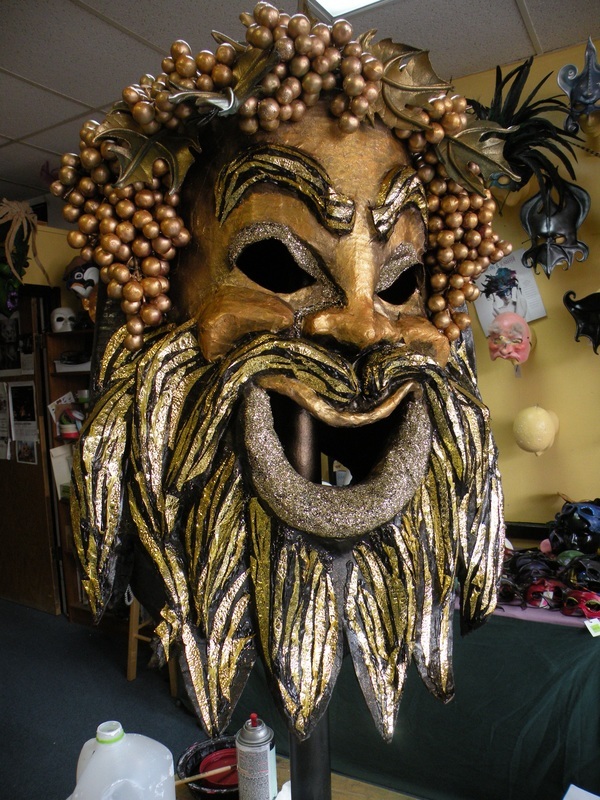 Making this two sided god head for his production of "Orpheus?" 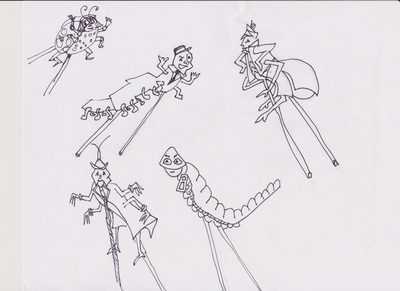 I was on it. 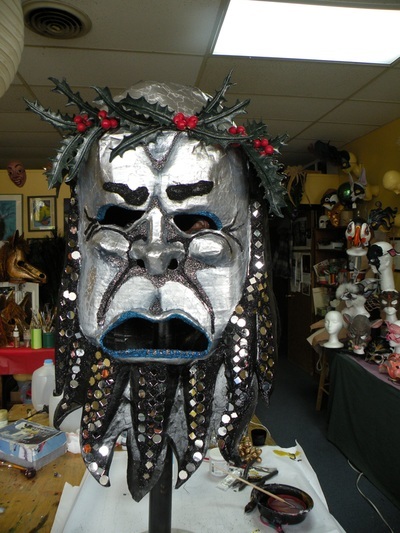 One side Dionysus, god of transformation. 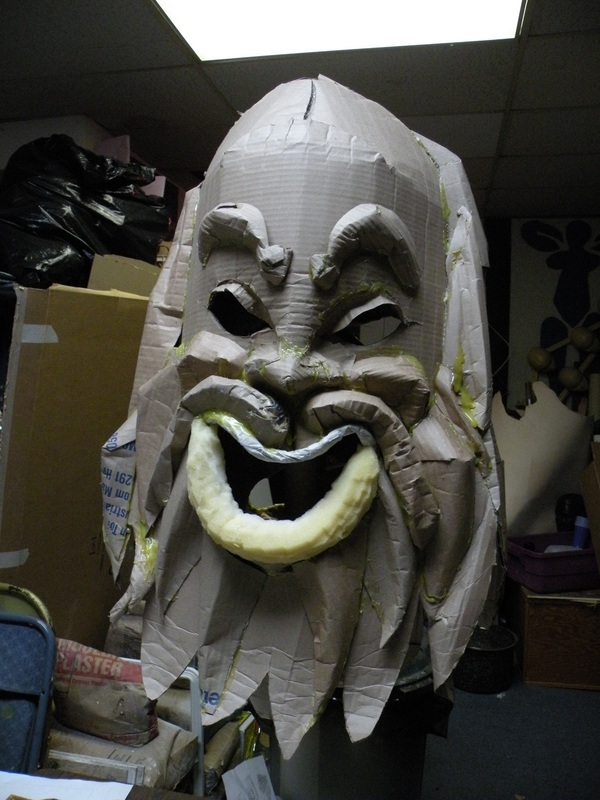 The other Hades, god of the Underworld. 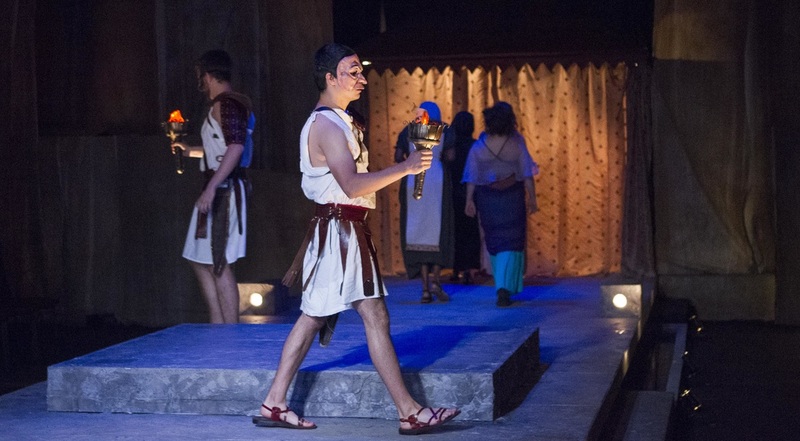 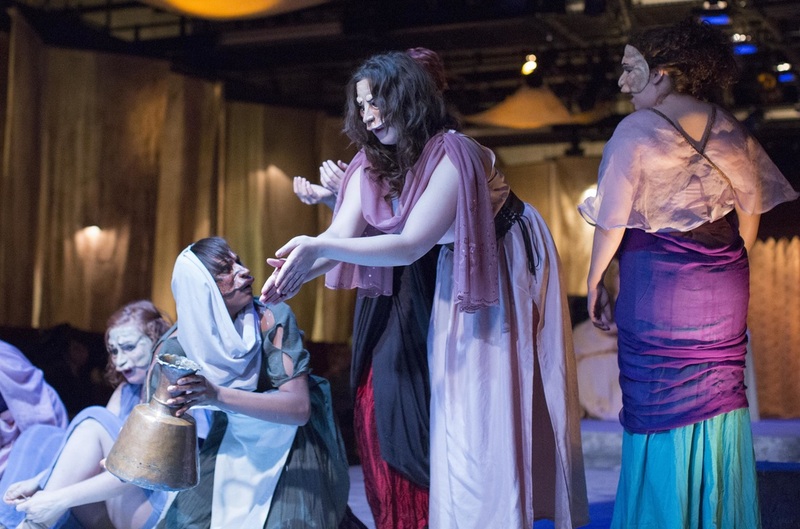 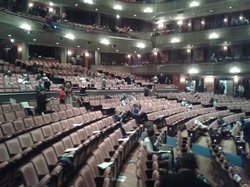 The play started at a Bacchanal. And with a turn of the head .... it moved to the Underworld. Had we any budget at all fog would have poured from his mouth and his eyes would have lit up. 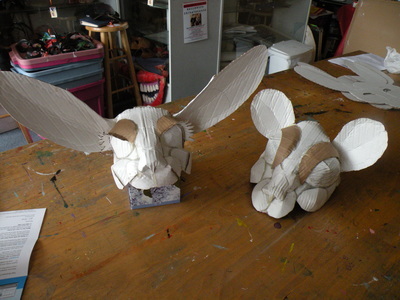 Instead they are still here in the corner of my studio.... Ready to rent.....? 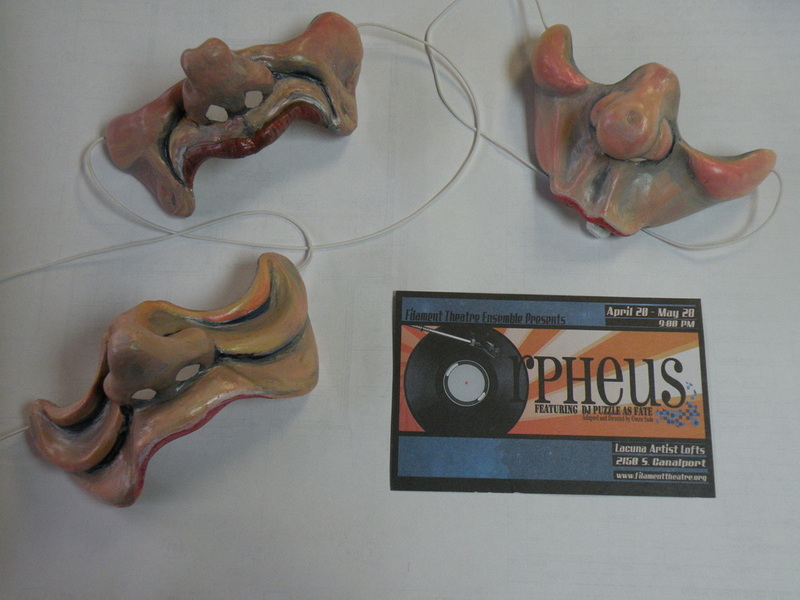 There were also three Buffos in Omen Sade's "Orpheus." 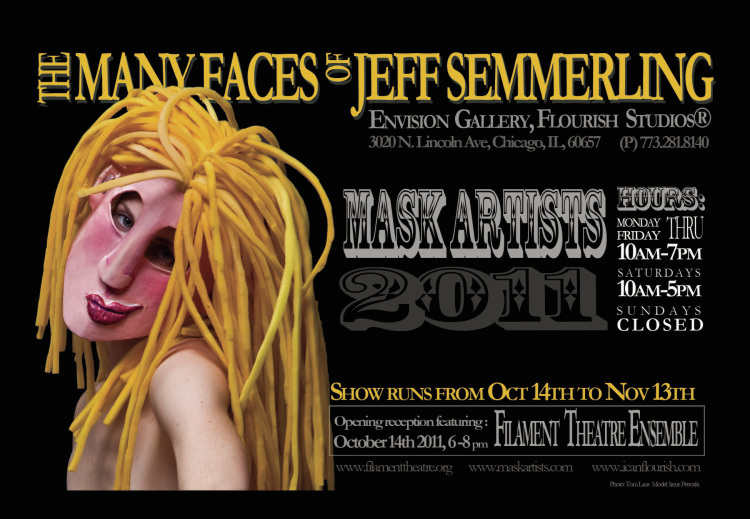 Presented and produced by Filament Theatre. 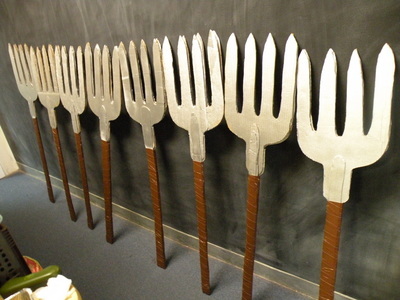 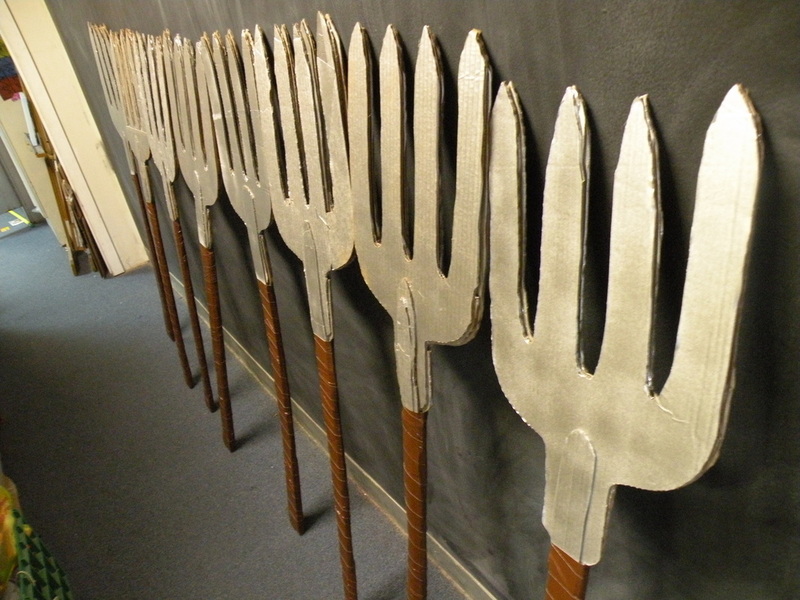 Cardboard Pitch Forks.... See my instructional videos to see how to make them and cardboard torches. 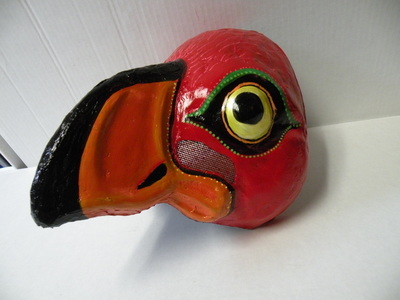 Anger Bird, from "Ash Girl." 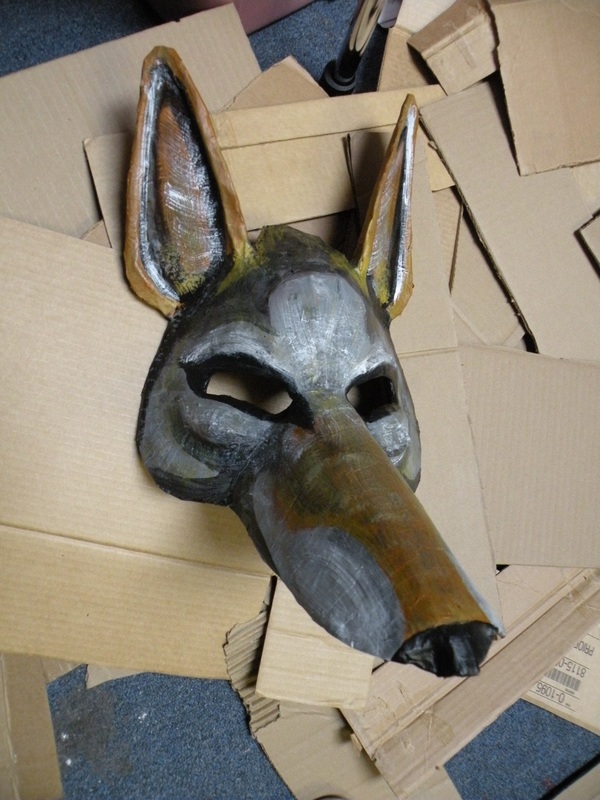 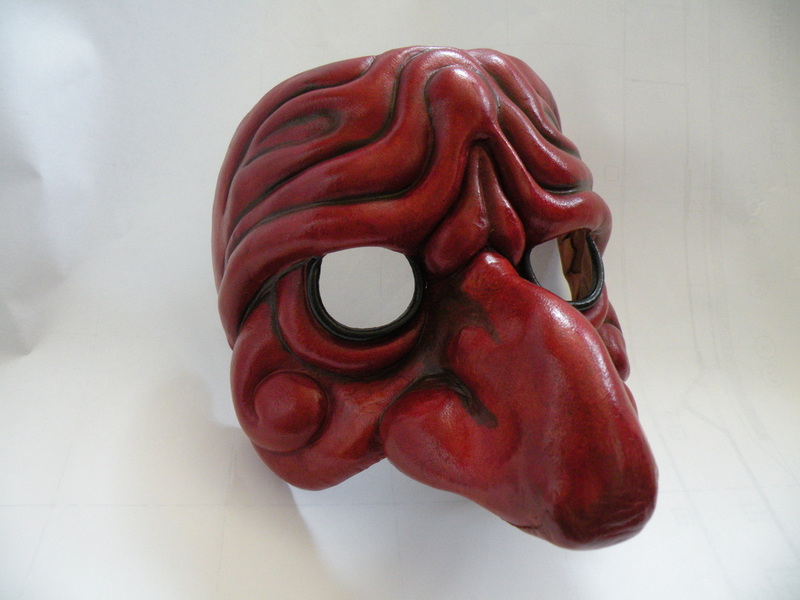 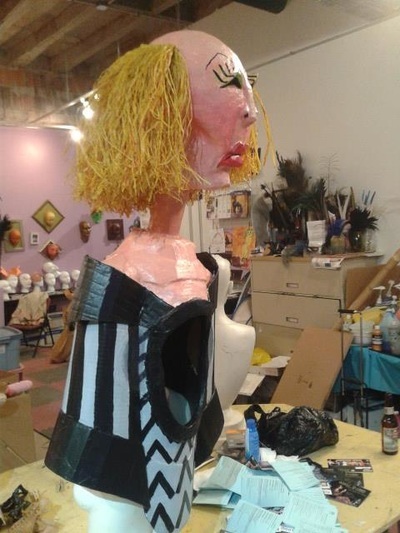 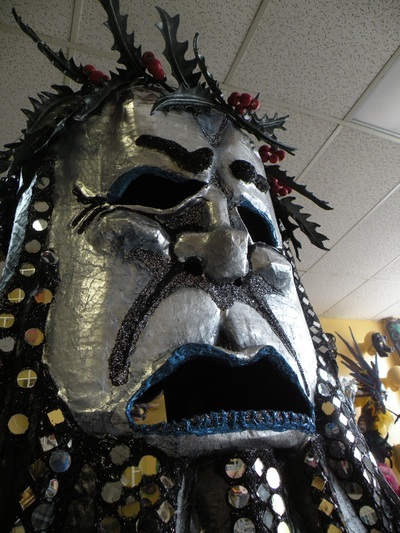 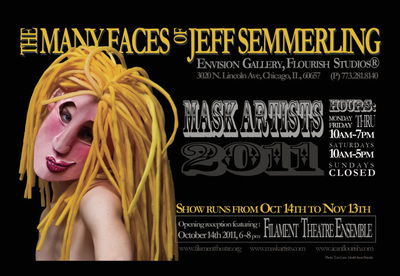 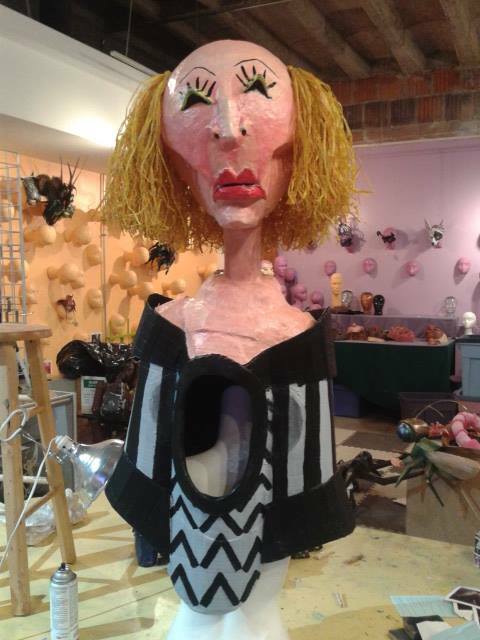 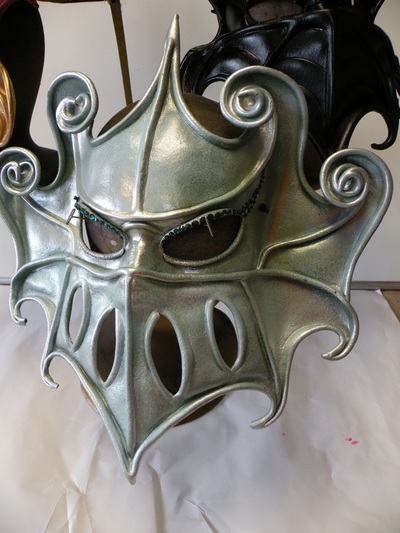 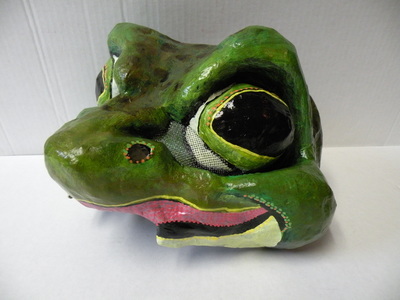 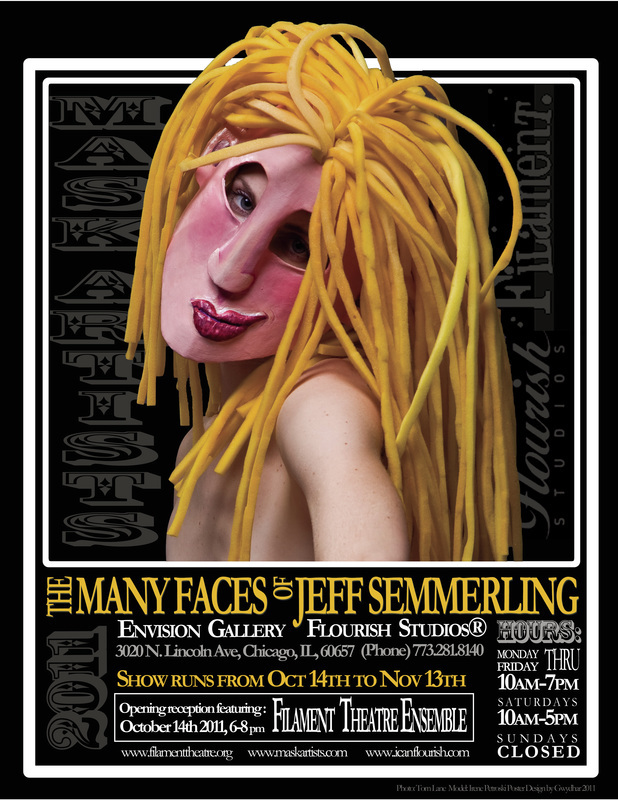 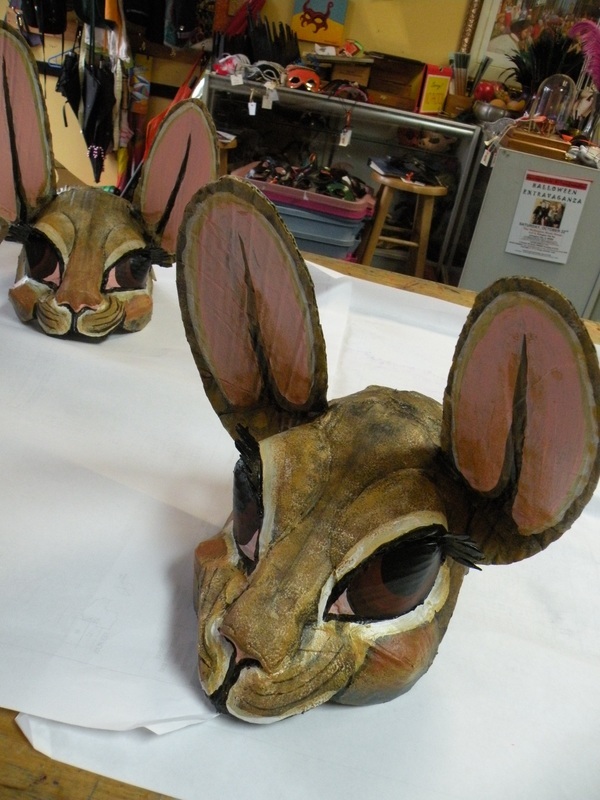 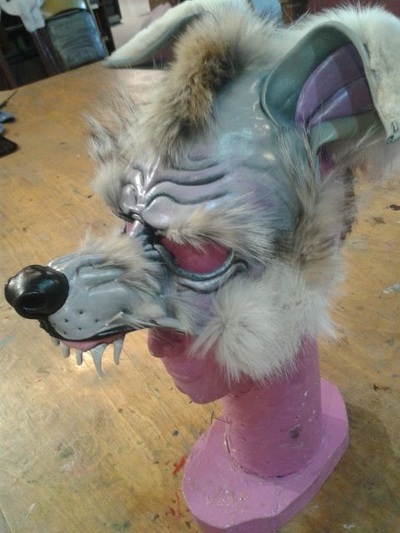 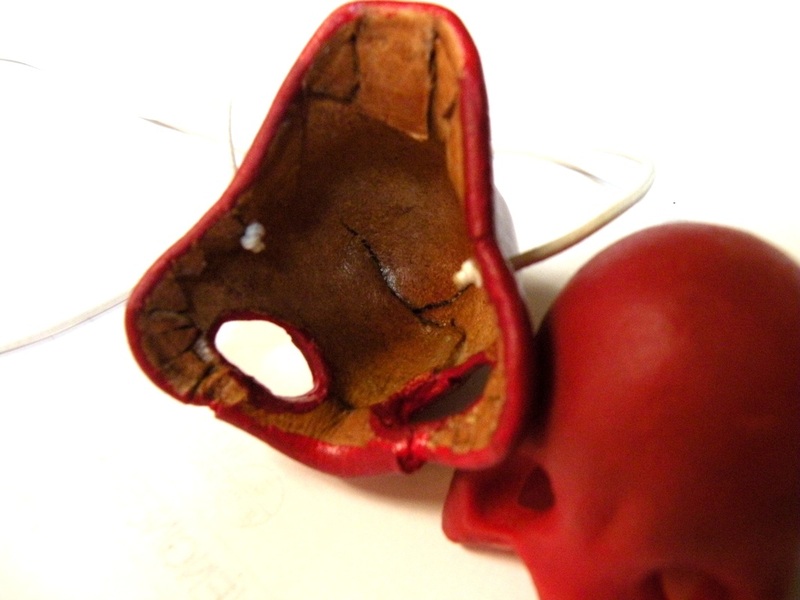 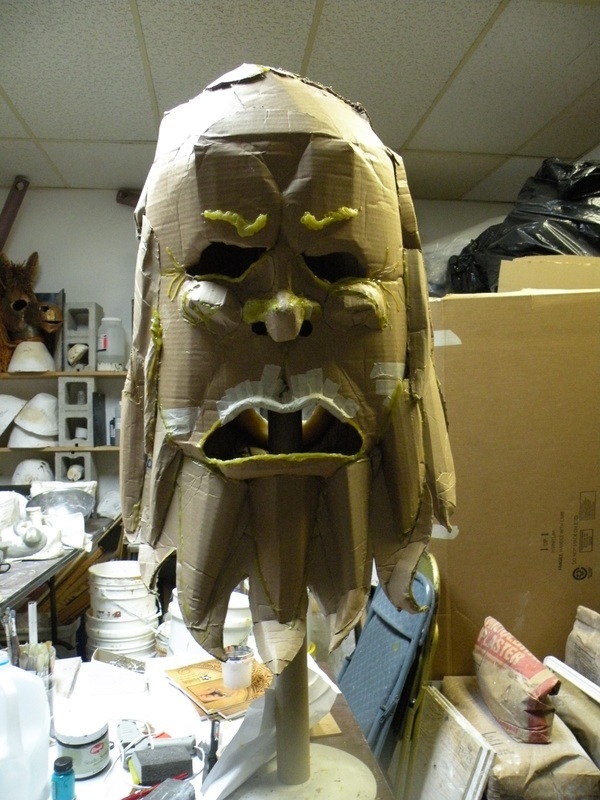 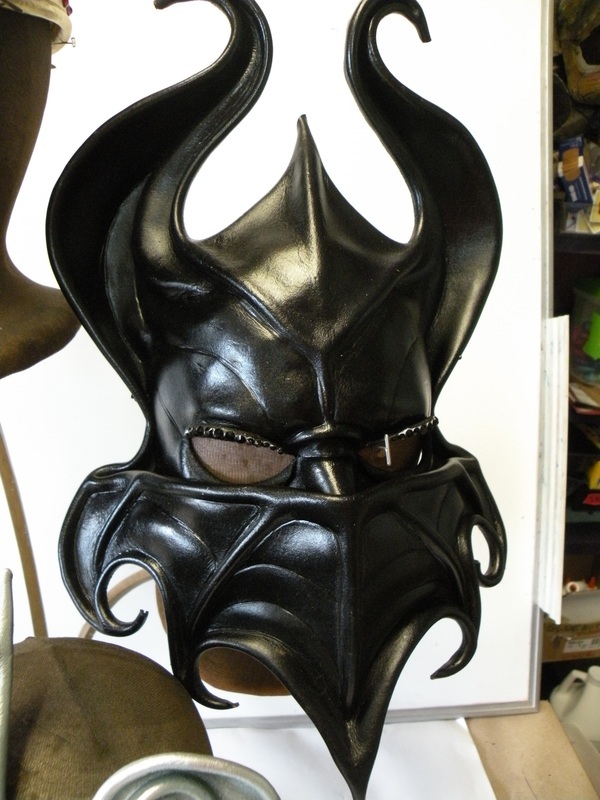 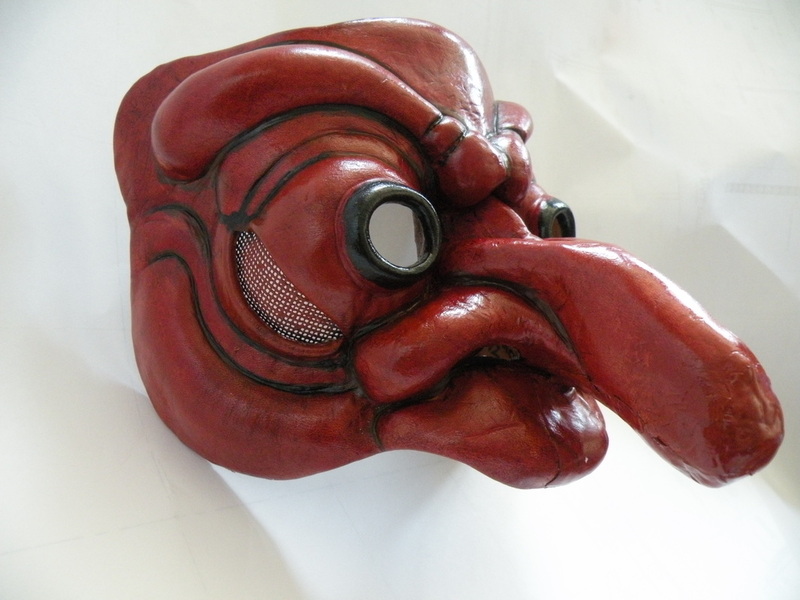 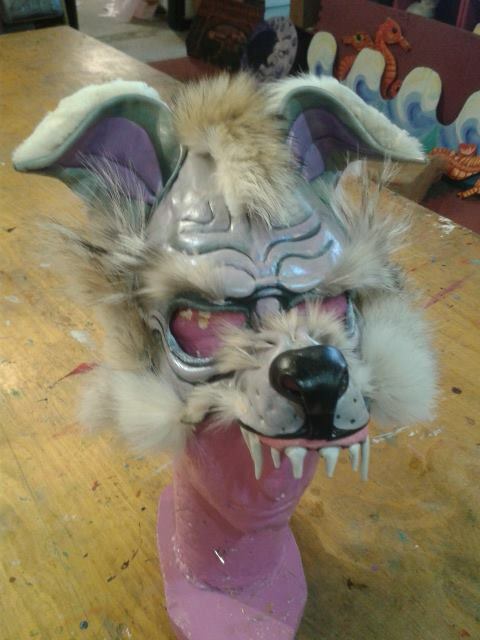 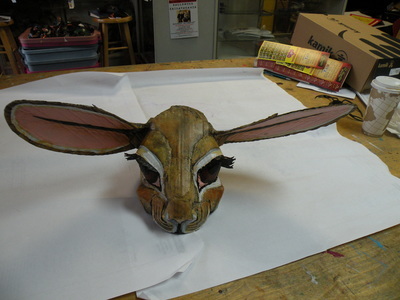 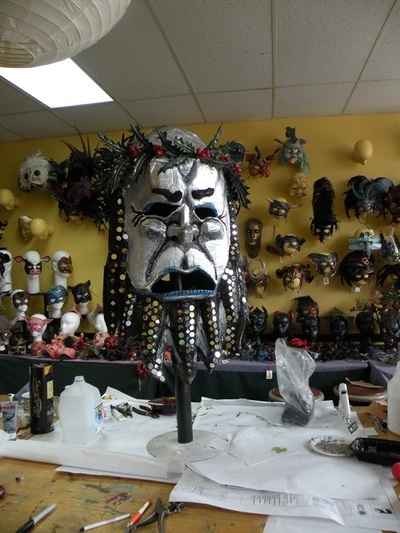 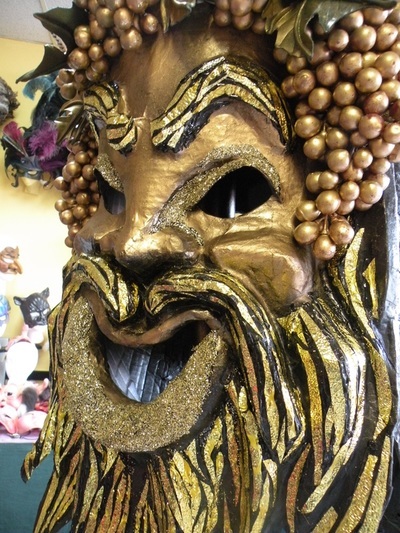 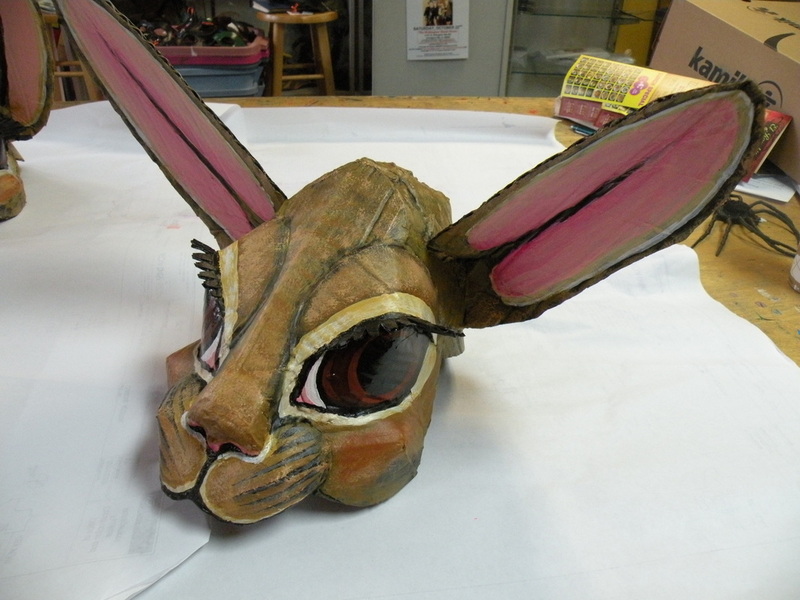 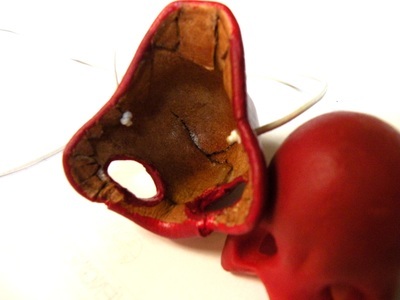 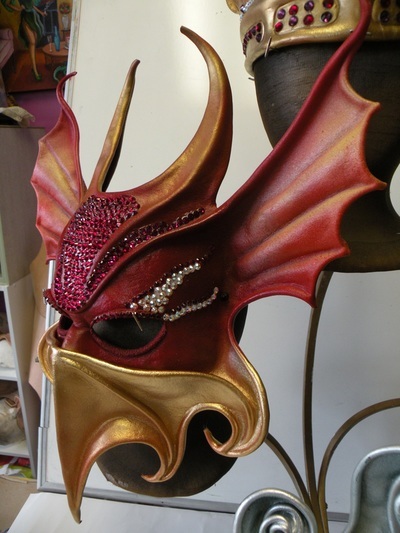 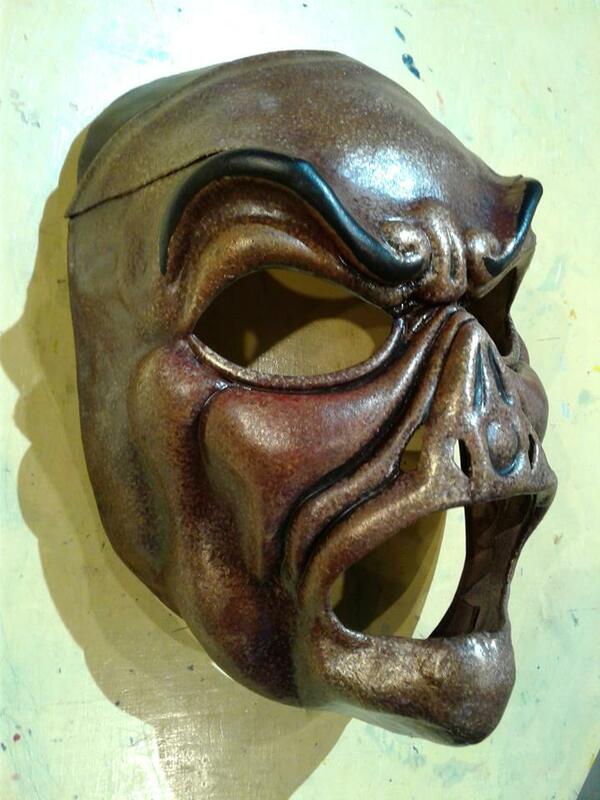 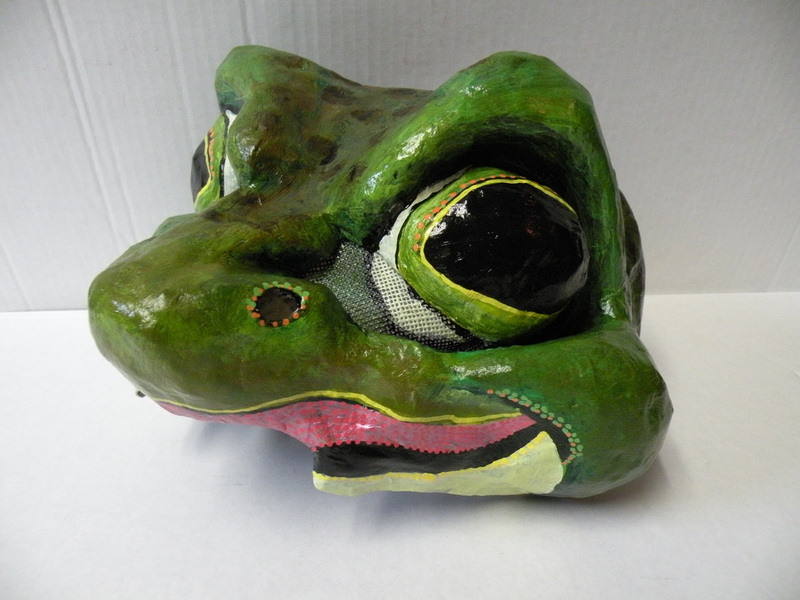 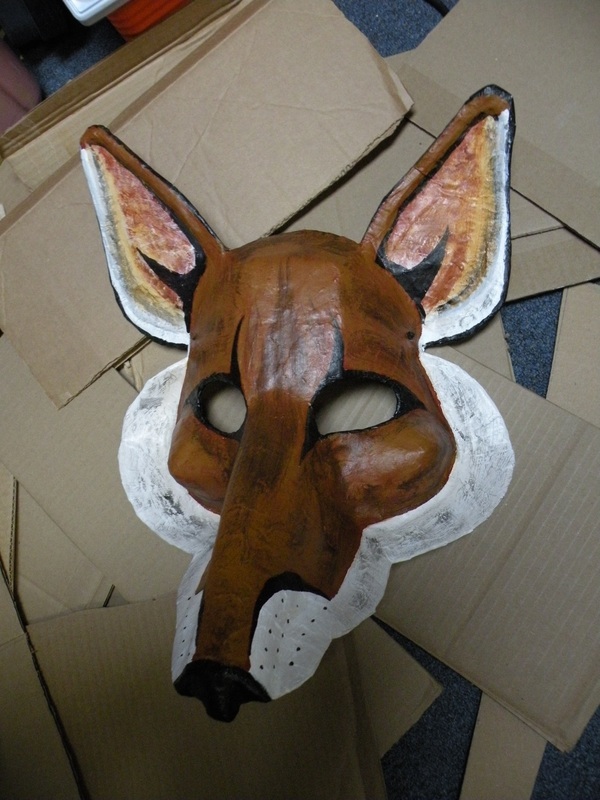 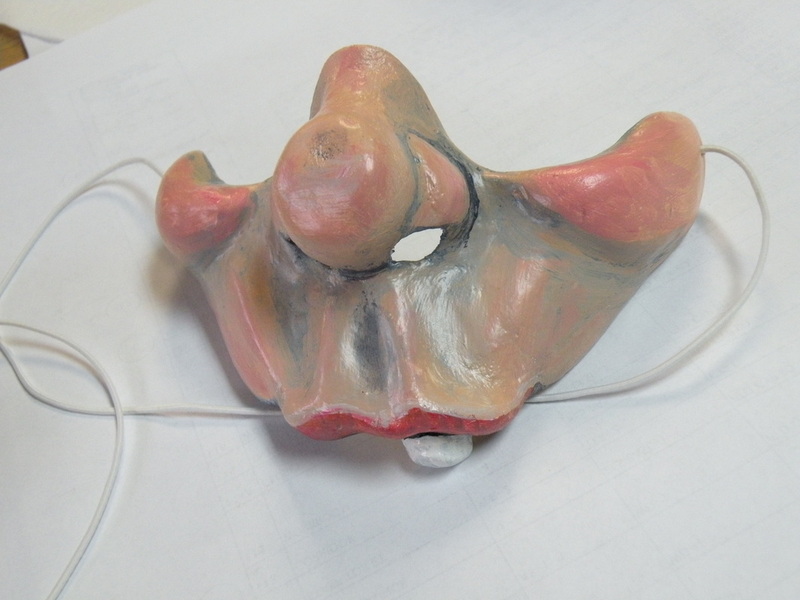 This Mask was designed for the film "Persephone," by the talented film maker Gwydhar Bratton of Blue Damen Films. 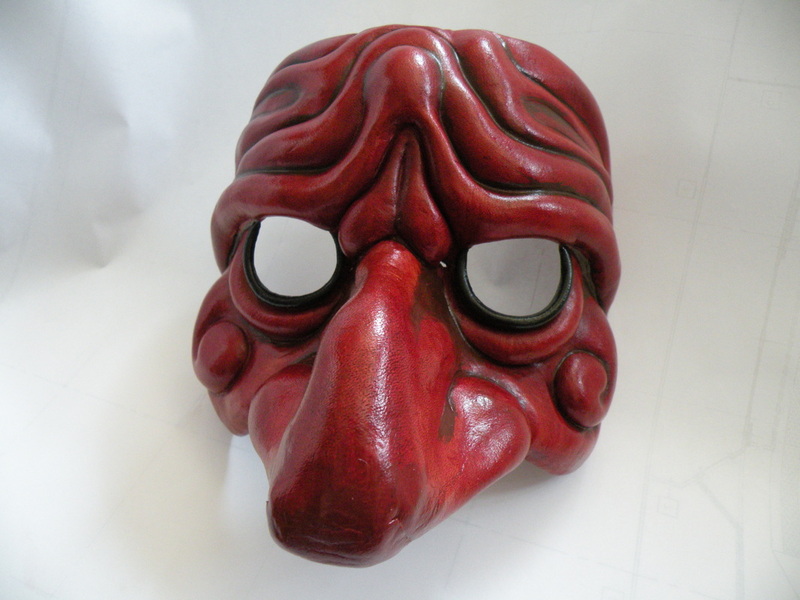 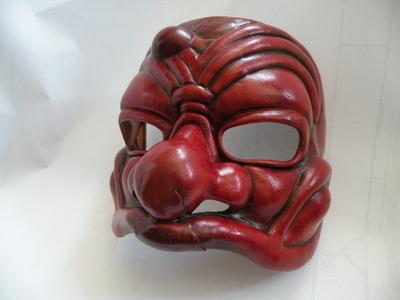 Go to my "MASK SHOP"